Get it? 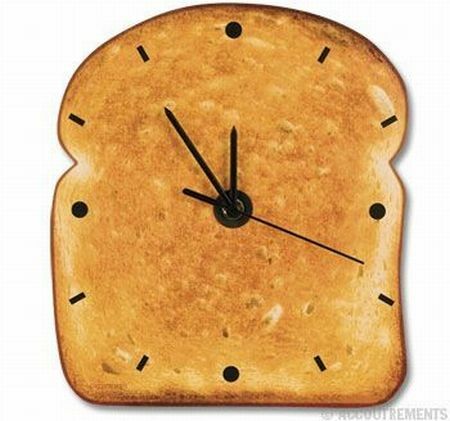 It’s a toast clock. Now, here I am, in a place I didn’t expect to be for longer than a couple of minutes. It doesn’t matter where it is. It could be the bathroom, it could be the doctor’s office, it could be a shark tank or a church or on the side of the road waiting for the N to come so I can get on and sleep and mouth breathe on everyone around me. Sometimes I think most of my life is spent in these places, when dinner goes too long or a class didn’t get out on time, because it’s these times that stretch the most. These are the elastic times, when you could swear on a number of things, both holy and unholy, that more than a minute has gone by but alas the damned clock speaks to a different reality and the fish in the aquarium are pecking feverishly at the plants just like they were a minute ago. These are the extra minutes that no one wants. Everyone wishes for more time, but what if somehow the request was granted but instead we spent another sixty minutes waiting in lines in a 25-hour day? Maybe what we do with these nothing minutes is important, because if we ever got past feeling like they were unbearable we could write a song, or think of a way to make a loved one feel appreciated, or give Suzie a call. Who’s Suzie anyways? These are all things we could find out. If you really want to go for it, talk to a stranger in line and see how uncomfortable that makes you and everyone. At the very least, you’ll have a great story. At the most, you’ll have an interesting conversation and maybe a couple extra bucks in your pocket if you decide to go for coffee afterwards and the other person pays for some reason. This is all theoretical, so don’t blame me if this doesn’t happen and all you get are scared stares. I’m just the messenger. Waiting time is time, so we should use it. I should use it. And especially Suzie should use it. Whenever I’m waiting for something, I just think about how awful it would be to be sprinting. I’m pretty sure that Steve Jobs was stuck in a similarly elastic situation when he invented the iPhone. He was probably staring at some variation of that toast clock brainstorming: How can we, as Americans, effectively combat unexpected boredom while also avoiding potentially uncomfortable interactions with strangers and make bank in the process?? Of course, we are now so accustomed to being entertained that when our phones inevitably die and we are caught, even for just two minutes, without our Zynga word games, heaven forbid, we have no idea what to do with ourselves. Talk to a real person? What is this, 1994? That is why I’ve refused to get a smart phone. It has nothing to do with the fact I have no money. Same thing goes for text waiting periods. I talk to strangers when I’m bored. (It’s either that or shove the first pointy thing I grab from my purse into my eyeball.) People are normally taken off guard and their initial reaction is hesitant, but I was blessed with a freckled-face with dimples, so they end up coming around. Most of the time they are happy to be talking to someone else too. They just appear to be non-approachable. It’s the best thing to pass those painful minutes by. Now I’m going to start conversing with everyone blessed with dimples and freckles. Time is relative. Compare the time it takes to kiss your lover to the same time it takes sitting on a hot stove.